The network has new images 6.1-inch LCD iPhone and 6.5-inch iPhone X Plus. We already have several photos and videos with the anticipated new models of the iPhone 2018. Today’s pictures have not revealed anything new. Most likely, these are the same layouts as in the previous photos. 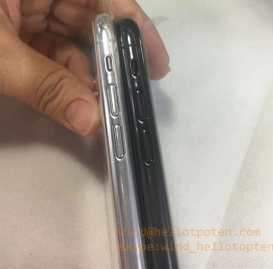 The photo shows a 6.1-inch LCD iPhone with one main camera. From the photo, this is not visible, but the LCD model will have an aluminum frame instead of a steel frame, which is due to its low cost. The 6.5-inch iPhone X Plus with OLED-display has a dual camera. Its design corresponds to the design of the current iPhone X. This model will have to contain 4GB of RAM and up to 256GB of standard memory, accelerated Face ID technology and more powerful stuffing. Apple should release an LCD version of the iPhone with support for two SIM-cards for China. The model will be designed for buyers with a limited budget in China and India, where inexpensive smartphones with two SIM-cards are very popular. The model will be available in several new colors, and the iPhone X Plus and 5.8-inch iPhone X only in silver, gold, and black.